The university now uses a new electronic option for vendor payments, and W-2 forms and other employee paperwork. In addition, a mobile app allows the campus community to book and track travel and expense reports. In partnership with the Office of Sustainability and Campus Dining, NAU Athletics educated tailgaters about recycling with student volunteers, procured compostable materials to distribute food and ran informative messages during the game that promoted campus-wide programs. To reduce glass, the university held a Green Wine Contest in which they determine the best wine that comes in a box or can. Designed to get ​the university closer to its goal of diverting 90 percent of campus waste from landfills​, the new two-story, 19,500-square-foot building includes designated space for waste composition analysis and educational outreach and collaboration with students. 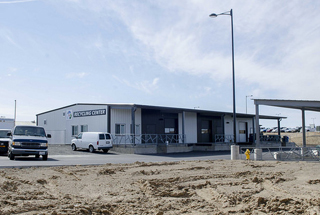 An intent of the new facility is to more easily accommodate changing waste streams and difficult-to-recycle items. After the general manager of Campus Catering began attending industry conferences, the amount of material diverted from landfills rose from nearly zero percent to approximately 90 percent over the past six years. One strategy in particular is using refillable jug water dispensers and compostable cups opposed to plastic water bottles. 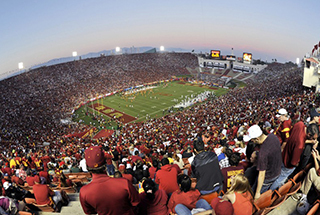 Building on the university’s efforts to reduce the tons of waste produced each football game, the university stadium's trash cans will be transformed into compost bins this football season, as the 90,000-seat facility attempts to achieve “zero waste” status in collaboration with the university's Office of Sustainability. The university collaborated with Re-Matt, a new, mattress recycling company, in an effort to reduce the amount of mattresses that end up in landfills and illegally dumped. 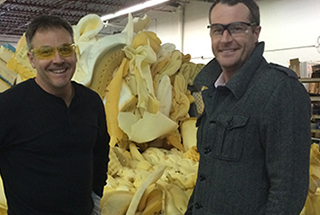 Re-Matt is able to recycle up to 95 percent of a mattress into reusable products. The university's Sustainability Committee received a Kentucky Pride Recycling grant for $10,701 and a $2,300 donation from G&J Pepsi-Cola Bottlers Inc., to purchase 1,250 six-gallon recycling totes for residence hall rooms. The idea for installing bins came from a student during the 2015 RecycleMania competition. 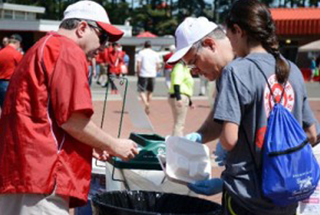 University Athletics and the Waste Reduction and Recycling Office are partnering to add stadium composting bins, which will be used to collect food waste and other organic material from each game during the 2015 football season. 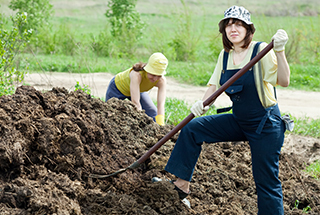 Collected material will be combined with other campus food waste and turned into a nutrient-rich soil amendment. Kill the Cup recently announced the participating schools that will engage in a four-week, nationwide campaign that encourages students, staff and faculty across the country to reduce waste from disposable coffee cups. The campaign, which runs from Oct. 5-30, will reward the university that serves the highest percentage of drinks in reusable cups at participating coffee shops. Opened in 1961 and is slated for deconstruction in 2016, the construction waste management plan for the university's round building indicates 95 percent diversion rate through donation or transfer of usable items and working with a facility that specialized in construction and demolition waste in order to reuse and recycle nonhazardous material. 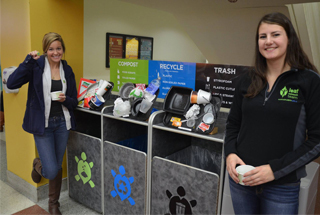 Attempting to increase the campus' waste diversion rate, the new pilot program is a combination of a recycle and waste bin at each employee's desk in one of the campus' newest buildings. The university's Surplus Department and Housing and Dining Services diverted over 18 tons of reusable items this year through the Leave it Behind program, which netted just over $7,000 to fund eight students in the Eco Leaders Peer Education Program who raise sustainability awareness in the dorms. Delivered by the Cola-Cola Foundation and Keep America Beautiful, the 31 college and university recipients are scattered throughout 18 states. The university's annual campaign coordinated by the Office of Sustainability diverted thousands of usable furnishings and food from landfills this spring and into the coffers of regional charities that help people in need. As part of a national recycling grant from Keep America Beautiful and The Coca-Cola Foundation, the new bins will be placed around six buildings on campus. 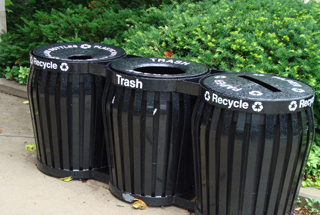 The university was chosen by Keep America Beautiful based on the extent of its need, recycling experience, and its ability to sustain the program in the future. 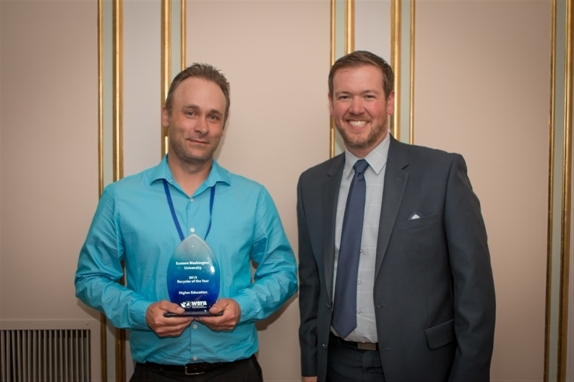 The university was recently honored as the 2015 Higher Education Recycler of the Year by the Washington State Recycling Association for dedication toward strengthening and expanding recycling and waste prevention practices. 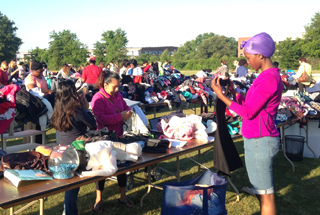 A small group of faculty, staff, students and administrators managed to raise over $19,000 through this year's sale of unwanted and discarded goods from students, faculty and staff. Funded by an Alcoa Foundation grant of $100,000, the new Android app, RecycleNow, helps communities maximize their recycling efforts by providing municipalities the ability to explore the economic, environmental and social impact of potential changes to their existing recycling programs. As a result of placing 130 Big Belly receptacles throughout campus, old trash bins were creatively repurposed into flower planters for the summer. The university decided to maintain a dual-stream recycling system, one collection for paper and cardboard, and the other for cans, glass and plastic, ensuring that recycling happens at the highest level possible to maximize resource reuse and to keep a lower rate of contamination. This year’s Give It Up For Good yard sale collected 19 tons of donations from university students, faculty and staff and raised over $13,900 for the Central South Carolina Habitat for Humanity, beating last year’s total of $9,800. The university will partner with the organization to build or rehab a house this fall with raised funds. Blue bags capture items including dry cell batteries, shiny plastic wrappers and bags, single-use coffee pods, and small e-waste not currently recyclable as part of the university's current blue bin commingled recycling program. 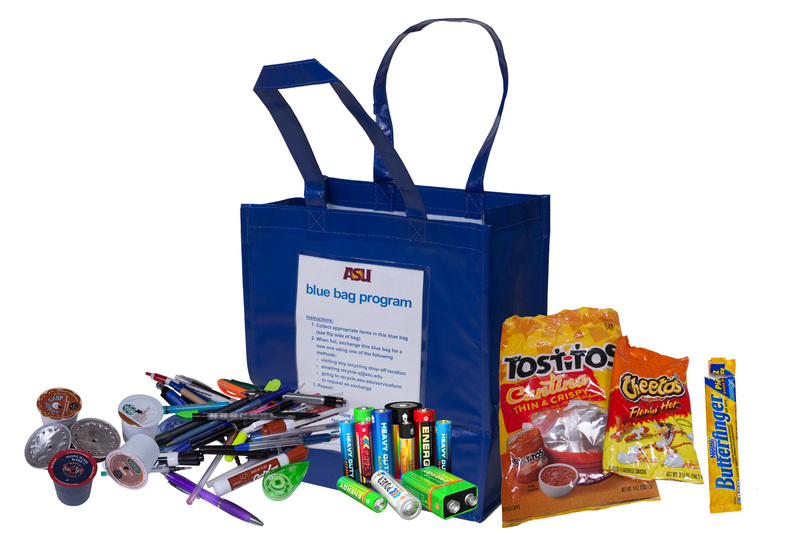 Blue bags are available free of charge to offices and departments across the Tempe campus. 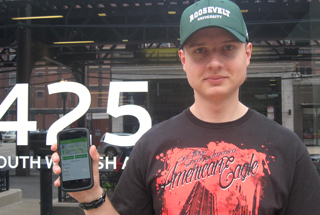 As part of a sustainability studies program course, honors student Dusan Koleno created the Google Play app, Recycle Tracker, to enable users at home and office to keep track of what and how much they are recycling with comparisons, including pie and bar charts, that can be viewed by weekly, monthly or annual usage. 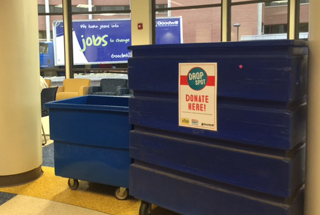 In an effort to reduce end-of-year waste, Chuck it for Charity is a campus move out donation campaign where Goodwill of Kentucky provides donation bins in several locations on campus so that students can donate gently used clothing, shoes, small appliances, decor, books and school supplies, and miscellaneous household goods. The new 6,964 square foot facility supports the university's ongoing commitment to sustainability and was designed to efficiently process the 331 tons of material handled each year. A new materials compactor/baler and electronic truck scale was installed. The center is also the new home for EWU Surplus Sales, which promotes the re-use of items no longer needed by the university. 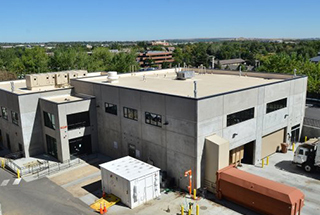 The university's Facilities Management Solid Waste and Recycling Unit recently confirmed the university has achieved an 89 percent institutional diversion rate in 2014. The rate increased by more than 10 percent from 2013. The institutional diversion rate reflects all materials the university diverted from landfills, including construction and demolition waste. The college's Media Production team produced a short film highlighting “Mount Trashmore,” the key event during RecycleMania. 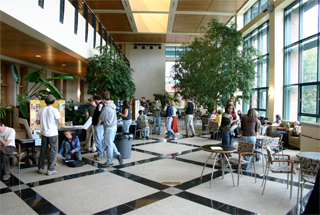 The event served as an educational activity for students participating in Campus as a Living Lab and Service Learning projects while also emphasizing the college's relationships with community partners. 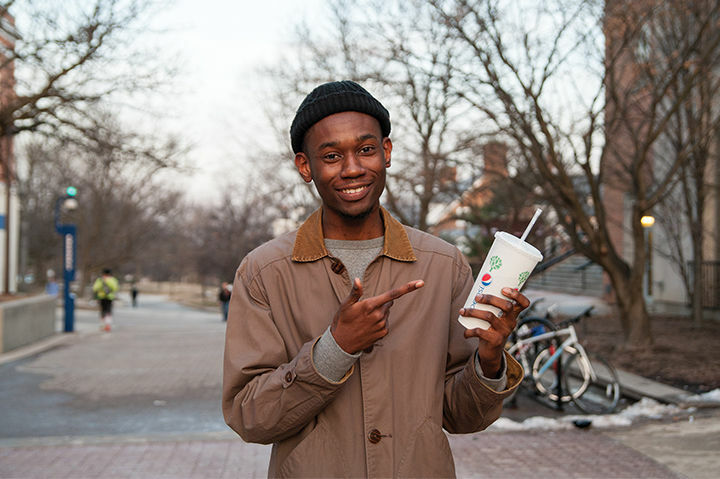 As part of its sustainability efforts, Dining Services recently replaced its blue Pepsi cups in the North Campus and South Campus dining halls with fully compostable cups this semester. Reducing food waste is the motivation for dining services' new process that captures food scraps from the food preparation process. The newly installed dual-stream recycling system on every floor of one of the campus' largest residence halls was the result of the university's Student Government Department of Environmental Affairs goal to increase access and convenience. The new promotional video that encourages and educates about recycling was created on behalf of a contest, which won first place. (Malaysia): The new campaign, started by students driven by the desire to reduce greenhouse gas emissions from methane, includes food and garden waste, paper, plastics, metals, textiles, electronics and wood and includes a special focus on reducing organic material, which accounts for over 50 percent of discarded material. (Australia): Aligning with the university's goal to reduce waste and provide alternative choices, three new refilling vending machines have been installed that dispense chilled, filtered water or sparkling water at a low cost to users, in addition to 18 bottle refill stations. (Australia): Hoping to increase recycling rates and reduce the use of plastic bin liners across campus, the new two-bin system allows for mixed recyclables, plastic, glass, cans and paper, and general waste. (U.S.): With the high number of complaints about the university's use of foam containers, the university recently transitioned to compostable to-go containers available in four different sizes. The university's Office of Sustainability has developed a process for event planners to follow to achieve event landfill diversion rates of 90 percent or more. The sustainability office offers containers, scales and other materials for free check out in addition to interns for consultation. Contributing to the university's greenhouse gas reduction targets, the new Earth Flow compost unit handles approximately 25 tons annually of landscape waste and post-consumer food from the university. Each batch takes roughly three weeks to create usable landscaping material. 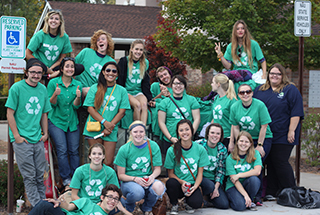 Clark Composts, a student group dedicated to education and expansion of campus composting, assisted in expanding intake of compostable material by equipping the library with bins. The student group will focus next on instituting composting in the newest residence hall and in academic departments. Since October 2014, more than 1,000 pounds of food have been provided to local charities from the university's Food Recovery Project that collects and redistributes the surplus food from a new dining hall. The new student chapter recovers leftover pre-made food from various locations across campus, including home football games and soon, baseball games, and delivers it to various partner agencies around the city, where it is later distributed to people living in shelters or those who are in need. The university recently partnered with a biofuels company that collects used cooking oil from campus dining facilities and recycles it into biodiesel. The university's new recycling center will manage and encourage the collection, sorting and processing of recyclables, such as paper, cardboard, plastic bottles and aluminum cans. The new center will also house a cardboard bailer and provide workspace for student interns and volunteers to assist with the recycling program. Organized by the university's Student Union Assembly and the Sustainability Office, the event aims to motivate campus users to properly dispose of waste and encourages campus stewardship. 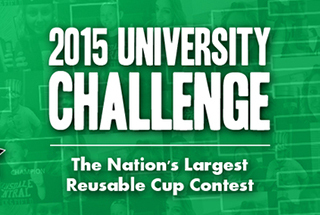 This year's competition to encourage waste reduction and recycling on higher education campuses features participation from 48 states, the District of Columbia and Canada. New this year, students can post digital messages and selfies that document their reduction efforts in order to earn points. (U.S.): As part of the university's Go Green initiative, buildings now have paper, plastic and aluminum recycling bins available throughout campus. 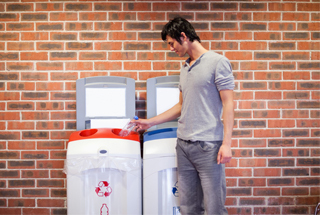 This is the first campus-wide recycling plan implemented at the university in over a decade. (Oman): Students and staff of the college collected 661 pounds of plastic for recycling as part of a new program to reduce total amount of waste. (U.S.): Over the most recent winter break, 70 staff and faculty moved, including the contents of five storage rooms, to a newly renovated building without renting a dumpster or increasing its regular trash pickup schedule. (U.S.): Expecting to replace worn out staff uniforms once or twice per year, the university partnered with a locally-owned and operated textile recycling company to repurpose them into dust rags. (U.S.): After past surveys revealed that 84 percent of the campus community would recycle if it was more convenient, the university, aided by funding from West Virginia Department of Environmental Protection, added bins to common areas, classrooms and offices.